Over the last few years there has been a keen interest in discussing the notion of public space; demonstrations, camps, collaborative projects, artistic interventions, community projects, social activism are just a few names that exemplify the different forms of engagement that deal with the complexities of it. Despite their different aims and impact most of these actions have given evidence of the need to re-appropriate the public space; through collective and networked practices individuals, groups and organizations ‘challenge the conventional notion of public and the making of space’. Although the liveness and even virality of these events, projects or actions hinder any prediction about its midterm effects or endurance, the fact is that there is an emerging legacy that is already dismantling certain assumed thoughts about ‘the public’. The retiree Hüseyin Çetinel’s initiative of painting a public stairway with rainbow hues in his neighbourhood in Istanbul has been the last case involving cultural transformation, virality and social activism. After he painted the local stairs to ‘make people smile’ and ‘not as a form of activism’ the municipal cleaning service painted over the stairs in dull grey provoking a chain reaction that mobilized citizens to paint stairways throughout the city. 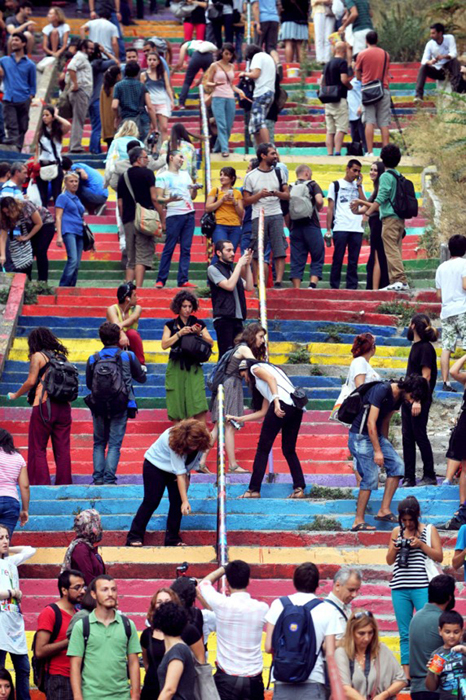 Local communities and social movements appropriated this beautiful participatory action as a form of protest after Çetinel’s stairway became viral in the social media. This example shows the intricacies of the public space and its expanded performativity. As Gus Hosein Executive Director of Privacy International argues ‘there is a confusion as to what is public space is and how it relates to our personal and private space’ in a social context where the emergence of the use of social media and surveillance as well as the appropriations of the space by private corporations and social movements and individuals are constantly questioning its boundaries. Istambul Stairways. Image from InEnArt. From my point of view, some of these actions that play in-between the social, political and artistic might be considered re-enactments of the public space as they aim to reconstruct the term itself by applying alternative procedures and by generating at the same time transductive pedagogies. However, in order to give a comprehensive understanding of the implications of the public space and its controversies it is essential to rethink the notion of the private space. Traditionally, home has been recognized as the physical private space; home is the main representative of the private sphere that encompasses the domestic and intimate. According to Joanne Hollows, ‘the distinction between the public and the private has been a key means of organizing both space and time’ and consequently to promote a clear functional division. This traditional perspective has been questioned and altered due to some current issues and events that are noticeably interconnected with those of the public space; an increasing number of evictions and homeless peoples, housing policies, escraches in front of the houses of politicians, the appearance of ghost neighbourhoods due to real estate speculation, home as an alternative space for performance practice and community development, among others. Thus, home might be conceived as a container of individuals and actions, as a social product or instrument, as topographical placement or as a relational structure. Home entangles interesting layers of analysis that might serve to establish new relational and yet responsive parameters to understand both the private and public space. Some of the following examples that perform between art, activism and affections corroborate the significance of home; as Blunt and Dowling state ‘home is not separated from public, political worlds but it constituted through them: the domestic is created through the extra-domestic and viceversa’. In Barcelona, the city where I live there have been noticeable factors that have stressed the importance of home as a topic of interest. Probably the most significant case is the increasing number of evictions―over 350.000 in the last four years―as many families cannot afford their rent or mortgage after losing their jobs (the unemployment rate is 26.3%). Beyond the personal implications and devastating effects that evictions have on families, they also indicate that home is not anymore our secure space or refuge; on the contrary, if the individual does not respond to the production and consumption requirements is physically displaced to the streets. Consequently, many citizens are trying to find shelter back again in the public space. If the 70s Richard Sennett announced the decay of the public space by the emergence of an ‘unbalanced personal life and empty public life’, the related problems with housing have provoked the reactivation of the public space at many levels. At the same time, there is an increasing culture of the debt that ties together individuals and financial institutions in long-term relationships. As Hardt and Negri explain ‘Being in debt is becoming today the general condition of social life. It is nearly impossible to live without incurring debts—a student loan for school, a mortgage for the house, a loan for the car, another for doctor bills, and so on. The social safety net has passed from a system of welfare to one of debtfare, as loans become the primary’ means to meet social needs’. 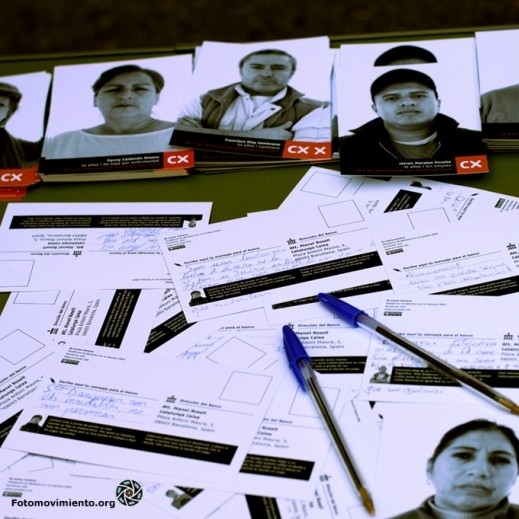 These ideas can be exemplified by the actions of PAH (The Platform of People Affected by Mortgage Debt), an activist group of citizens that stops evictions through demonstrations and guerrilla media actions in the streets and that also helps struggling borrowers to negotiate with banks and promotes social housing. This organized group of citizens has been awarded this year the Citizen Award by the European Union for denouncing abusive clauses in the Spanish mortgage law and battling social exclusion. PAH has received the support of the collective Enmedio that generates actions in the midst of art, social activism and media. For example, their photographic campaign ‘We are not numbers’ consisted in the design of a collection of postcards each one containing a portrait of a person that was affected by the mortgage debt by a local bank entity. The postcards were delivered in front of the bank’s main building for people to write a message. The written postcards were then stuck in the front door main door turning numbers into a collage of human struggle. PAH and Enmedio actions become highly effective thanks to their media impact and their virality in the social media. Invisible individuals isolated in their struggle, find alternatives through an assemblage of support that connects the public and private space and that is also mediated by informative and constitutive tools that the virtual space offers. As Paolo Gerbaudo claims ‘social media have been chiefly responsible for the construction of a choreography of assembly as a process of symbolic construction of public space which facilitates and guides the physical assembling of highly dispersed and individualized constituency’. Image of ‘We Are Not Numbers’ by Enmedio Collective. Processes of speculation, gentrification and eviction can be found in many western cities as well as different kinds of collectives and groups working for human rights advocacy. 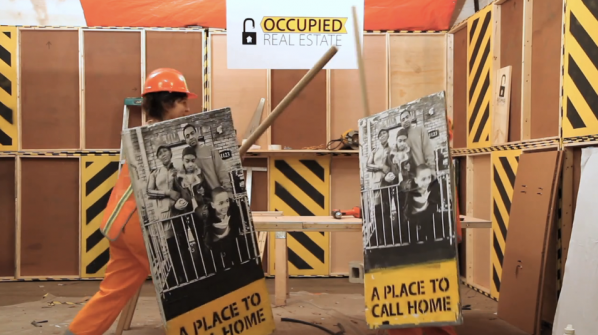 This is also the case of the Brooklyn based collective Not an Alternative has also carried out different guerrilla actions concerned with the problem of housing and eviction such as their series of workshops and media actions of ‘Occupy Real State’ or ‘Occupy Sandy’. Many of the actions that these collectives promote might be understood as DIY activism as they are based on the empowerment and the development of skills. In this regard, it is interesting to observe how DIY that traditionally has been related to activities in the domestic space serves as a strategy to protect it and to trigger new forms of protest in the public space while enhancing the creation of an expanded family (or at least a sense of togetherness) through the social media. Despite these actions, the public space is still home for many individuals. In the UK, different associations are concerned about the impact that the implementation of the bedroom tax might have, especially in London where the number of rough sleepers rises every year with an increase of the 62% since 2010-2011. The scenario is not different in many other European cities where beyond these worrying numbers there is also an increasing number of regulations and policies that difficult the life in the public space. As Suzannah Young stresses, ‘homeless people often need to use public space to survive, but are regularly driven off those spaces to satisfy commercial or even state interests’. Public space is often only open to ‘those who engage in permitted behaviour, frequently associated with consumption’. The increasing number of quasi-public spaces―’spaces that are legally private but are a part of the public domain, such as shopping malls, campuses, sports grounds’ and so forth― questions again the boundaries of the private and public space, especially when ‘some EU cities use the criminal justice system to punish people living on the streets for doing things they do in order to survive, such as sleeping, eating and begging’. All these policies have clear implications in the use of space and it is potential possibilities. The fact that the public space becomes home involves the reconsideration of the uses of the public space and the understanding of it through the eyes of the people that fully inhabit it. 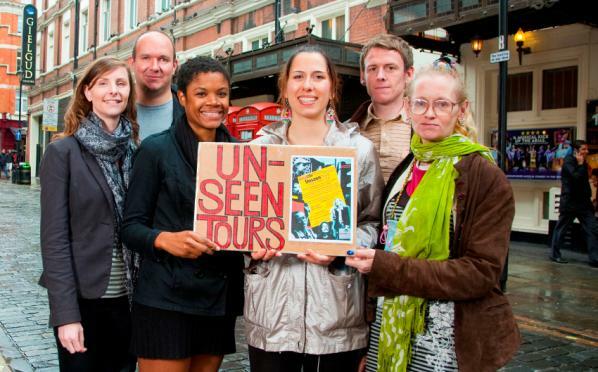 The London collective The SockMob run the Unseen Tours, alternative city tours guided by a group of homeless. Their embodied knowledge appears as a key aspect to develop these DIY versions of the city while promoting relationships between the homeless and the tour participants. Where is home? In which ways access to spaces gives us opportunities and rights as individuals? In which ways all these site-specific initiatives that often have a transnational reach re-construct the notions of private and public space? How these DIY and media actions are generating new forms of visual arts activism? Despite the fact that these queries might need further analysis, I believe that the qualities of space becomes visible and tangible through these interactive and responsive actions with the spaces. Recently, an international group of activists, visual artists and scholars have published a handbook in which their consider these forms of activism militant research. According to them, ‘militant research involves participation by conviction, where researchers play a role in the actions and share the goals, strategies, and experience of their comrades because of their own committed beliefs and not simply because this conduct is an expedient way to get their data. The outcomes of the research are shaped in a way that can serve as a useful tool for the activist group, either to reflect on structure and process, or to assess the success of particular tactics’. Hence, the idea of some hands-on, the acquisition of skills and the performance of theory appear as key aspects to disentangle and analyse the qualities of the space. From an artistic perspective home has been crucial in many historical periods of dictatorship to construct an underground scene of the arts; in many of these cases, the evidence of artistic practice appears through testimonials and documentation (photographs, fanzines, recordings, etc.). Again different forms of media help to make the clandestine public, crossing the sphere of the private into the public realm. Thus, the importance of documentation enhances different temporalities of reception and impact in the public realm. In this regard, a differed presentation of the artistic works triggers a reconsideration of the attributes of the spaces too. Currently, homes serve as a basic space for artists to present their work; in the case of music, this is a widely known practice in the US that is becoming more and more common in other countries and other art forms. Homes serve as a personal curatorial space for fine arts artists through the open studio festivals too; artists make their private space open for others as a strategy to show their work publicly. At the same time, in some artistic disciplines self-curation through digital portfolios is becoming increasingly used to showcase artworks. One way or another, home remains often the main space for creativity, production and curation through and expanded DIY conception of their profession. Home becomes even more crucial in a context marked by the arts cuts and the economic crisis. In this regard, there are initiatives that see an opportunity in the relationship between the public and private space not only to exhibit or perform art but also to trigger a counter-performative form of showing works. This is the case of the domestic festivals that try to challenge the concepts of cultural enterprise and institution by proposing home as a legitimate space of the artistic experience. Friends, neighbours and acquaintances offer a room or a space in their house for artists to perform there (examples can be found in different cities such as Santiago de Chile, Madrid, Berlin, Barcelona, etc.). At the same time, the format wishes to transform the spatial and affective relationships that citizens have with the space, by inverting the spatial dichotomy between the public and the private. Hence, the idea goes beyond to a practical solution to have a space to perform as it also aims to give visibility to performing practices that have not been yet legitimized by the public sphere and they are in danger to remain in a sort of clandestinity (as they are not part of the current cultural market). In this regard, there is also a sense of evicted or homeless art that is trying to produce a social context of experience and articulation beyond the immediate effects of the power that governs at many level the public sphere. These kinds of initiatives generate ‘an activity that undermines the exclusion by letting occur, at the very boundary which separates the public from the “secret”’, an articulation which challenges the prevailing framework of representation and legitimation’. The intersection between art, activism and affections help to explain the multiple and complex questions that configure the notion of home. With these examples I just wanted to stress the importance of home in the discourses that address the concepts of public space/public sphere/publicly. Thus homes ‘are thereby metaphorical gateways to geopolitical contestation that may simultaneously signify the nation, the neighbourhood or just one’s streets’. From a transnational perspective, home seems to pose the crucial questions that connect us with what is happening inside, outside and in-between the spaces and gives us a different perspective to analyse current artistic and social practices that engage with our mode of action, production and identity. I guess this is all from my home. Hou, Jeffrey. Insurgent Public Space. London and New York: Routledge, 2010. Hollows, Joanne. Domestic Cultures. New York: Open University Press, 2008. Blunt, Alyson and Robyn Dowling. Home. London and New York: Routledge, 2006. Sennett, Richard. The Fall of Public Man. 1974-76. New York: Norton, 1992. Hardt, Michael and Toni Negri. Declaration. 2012. Young, Suzanne. ‘Editorial’. The Geographies of Homeless: Homless Experiences and Homless Homeless Policy in Different Spaces. Spec. Issue of Homeless in Europe, summer 2012. Doherty, Joe et al. ‘Homeless and Exclusion: Regulating public space in European cities’, Survellaince & Society, 5:3 (2008). Bookchin, Natalie et al. Militant Researh Handbook. New York: New York University, 2013. From the article ‘Clandestine Publics’ by Stefan Nowotny, 2005. Brickell, Katherine. ‘Geopolitics of home’, Geography Compass 6:10 (2012). Experimental Theatre: Public Domain by Roger Bernat. It has been almost five years since Roger Bernat, a renowned artist of the experimental theatre scene of Barcelona, premiered ‘Public Domain’. The piece, still on tour, has been performed in public spaces around the world. This audience-centred show invites individuals to participate in this engaging experience that emerges as a sociological choreography. The audience gathers in a public square and they are given a pair of headphones. Nothing warns that a performance is about to take place despite the two signs located at the edges of the square that mark the right and the left. Through this simple but effective setting the piece starts. 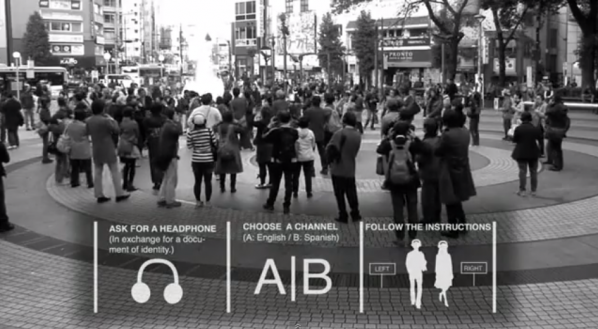 Welcoming words and introductory instructions are broadcasted to the audiences that immediately understand that the action will be mediated by the voice that is talking to them through the headphones. ‘Would you mind if I ask you some questions’― inquiries the voice. ‘Did you come alone because someone recommended the piece to you? If so go right. Did you come on your own initiative? Go left. Did you go to the play due to work related reasons? Go to the centre. Do you think there are questions that should never be asked? Put your hand in your mouth. Do you call home the place where you live? Put your hands together on your head.’ Through this mechanism, wrapped in the relative anonymity that the group offers, the audience reveals details of their intimacy or of their fictionalized intimacy. Are there supermarkets stealers among the audience members? Have they ever followed strangers? Did they study in public or private schools? Thus, the piece explores bodily narratives playing with the sociological aspects that the audience reveals through their answers. The development of the piece is constructed through questions that trigger the actions and drag participants into an immersive experience. Groups among the audience members are created and what starts as an entertaining proposal turns into a reflective exercise that interrogates our opinions, beliefs and experiences. Some members of the audience are on our side while others become our enemies; and then war bursts. The piece never loses its playful side although participants become aware of how the categorised distribution of individuals, without nuances, leads to a situation of confrontation. This is of course a simulation, but is this piece a transduction of reality? The theorist Shannon Jackson calls these pieces ‘social works’[i]. From her point of view, these pieces state some of the paradoxes of our systems and as experiments they contribute to discuss the nature of our public engagement. They unfold some of the contradictions of the agencies that operate in our systems while they give evidence of the relational parameters that we assume and accept to construct our social beings. In this case, the sample of audience members is taken as a small sociological study that through continuous dichotomies performs organisation and operation. The emergence participatory theatre and performance has brought significant changes that basically related to the fact that the audience members have become the raw material of the piece. This change clearly alludes to the aim of artists to incorporate innovate disruptive actions to discuss the matters affecting the current social arena. As Claire Bishop states, there are also tensions that emerge within the performance of these works; ‘quality and equality, singular and collective authorship, and the ongoing struggle to find artistic equivalents for political positions’[ii]. From my point of view, most of these tensions appear due to the game-work nature of these pieces. In a way, labour structures are enacted through instructions that often reproduce some of the basic rules of capitalism; the use bodies to make the system work. To which extent these practices subvert the traditional working relations? Is participation a necessary tyranny for creators to produce social changes? What are the affects and effects of these practices? ‘Public Domain’ also creates an appealing mobile bodily landscape. It is interesting to think about the relationship between the show and reality. The theatricality of the piece interacts with the social reality blurring boundaries, as one is part of the other. The piece is a social event that occurs outside the convention of a gallery, exhibition space or theatre. Thus, the citizens that are not part of the show assume this theatrical intervention as part of their reality, as part of the current social matters. The integration of technologies into the arts have widely contributed to perform new experiential practices. In this regard, technology plays an important role in triggering participation. Technology helps to distribute and operate instructions but also produce a specific aesthetics that appears thanks to the creation of hybrid practices. The interaction among disciplines and fields has given birth to fruitful collaborations and cutting-edge practices in the arts. The current convergence of the fields of nanotechnology, cognitive science, biotechnology and communications (ITC) has given birth to the most prolific period of inventions and findings in the history of science. The possible intersections between the arts and sciences are gaining day by day a bigger interest but most of its potential is yet to be imagined. In which ways will these practices will contribute to social change? Is participation the key for a major public commitment in matters that affect our daily lives? ‘Public Domain’ proves that through a rather simple system significant concerns can be addressed in a playful but effective manner in a project that has already engaged audiences from over the world. [i] Jackson, Shannon. Social Works. London and New York: Routledge, 2011. [ii] Bishop, Claire. Artificial Hells. London and Brooklyn (NY): Verso, 2012.